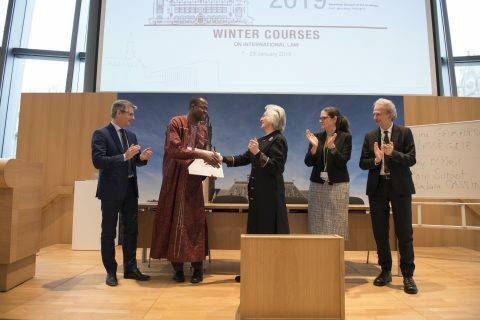 The Academy is pleased to announce that Mr. Gregor Novak (Croatia) and Mr. Apollin Koagne Zouapet (Cameroon) have been awarded the Diploma at the end of the first Winter Courses on International Law 2019, held from January 7 - 25 in The Hague. Mr. Gregor Novak (Croatia) receiving the Diploma from the Judges of the Exam. Mr. Apollin Koagne Zouapet (Cameroon) receiving the Diploma from the Judges of the Exam. The Jury of the Exam consisted of (from left to right) Professor Jean-Marc Thouvenin, Secretary-General of the Academy, Professor Emerita Catherine Kessedjian (General Course), Professor Emily Crawford (Director of Studies) and Professor Maurizio Arcari (Director of Studies). Simulation Exercise "Hours of Crisis"
Joint First Place for Lillian Robb (Australia) and Bhawna Chowdhary (India). Joint First Place for David Schenk (Germany) and Eduardo Jiménez Pineda (Spain). 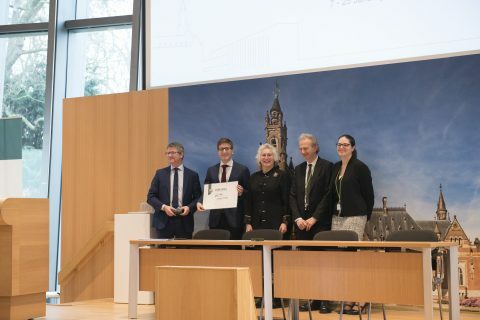 Joint First Place for Veritas Legal Consultancy: Anasuya Choudhury (India), Bích Hoàng Ngọc (Viet Nam), Isabela Rocha Faria (Brazil), Subham Saha (India), Anthony Ellington Wenton (UK) and Seven Seas LLP: Katharina Sarah Braun (Germany), Muhammed Nusry Ghazali Hussain (Sri Lanka), Caitlin Joensson (Australia), Lillian Orion Stuart Robb (Australia), and David Schenk (Germany). Ateneas Solutions: Bhawna Chowdhary (India), Paula Cortes Gonzalez (Chile), Keerthana Nagaraj (India), Michelle Lumi Rakue (Brazil), and Ekaterina Rogacheva (Russian Federation).